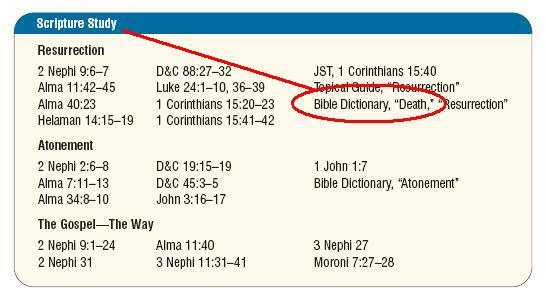 The Scripture Study section on page 52 asks missionaries to study the Bible Dictionary entry for "Death" which states explicitly: "Latter-day revelation teaches that there was no death on this earth for any forms of life before the fall of Adam. Indeed, death entered the world as a direct result of the fall (2 Ne. 2:22; Moses 6:48)." Three passages in True to the Faith that teach no death before the fall were discussed in an article posted on this blog May 15, 2005. "Intensive effort on the part of the First Presidency, the Quorum of the Twelve, other General Authorities, and most capable teams of devoted, experienced staff members produced Preach My Gospel and its planning tools. Those who participated in its development are witnesses of the inspired direction of the Lord through the Holy Ghost in the conception, framing, and finalization of the materials in Preach My Gospel. Three times on page 14, twice on page 23, twice on page 42, twice on page 52, and twice on page 90. See also pages 21, 24, 25, 34, 62, 63, 66, 73, 91, 92, 93, 95, 106, 117, 118, 119, and 182. See pages viii, 21, 35, 92, 117, 165, 171, 182, 221, and 228. I took a religion class from Brother Bott at BYU. One of my fellow students asked him if the footnotes, Bible dictionary, etc. should be considered scripture. Brother Bott started laughing. He explained that he had helped to write it, and so it couldn't possibly be scripture. He didn't have a terribly high opinion of it. Notice that the introduction to the Book of Mormon was changed recently--the Lamanites are no longer referred to as the "principal ancestors of the American Indians." Sometime what we think is "doctrine" or "scripture" really isn't. While I fully agree that missionaries (and members alike) should become familiar with the meanings and definitions in LDS doctrine, the "True to the Faith" and the "Bible Dictionary" are just commentary and supplemental to the gospel. It’s easy to recognize true doctrine: The living apostles, who hold the keys, expound it. The Lord reveals his will through living apostles under the direction of the First Presidency. What they (the First Presidency and the Twelve) unitedly send forth is what the Lord himself would send forth. The LDS Bible Dictionary has been bound in with English copies of the LDS edition of the Bible for 30 years now. After all those years, if what it says is so laughable, tell us why the First Presidency and the Twelve have unitedly asked all missionaries to study its articles during Scripture Study. Tell us why members of the Quorum of the Twelve continue to quote from it in general conference, including the most recent general conference. While I'm in full support of the fact that the Scriptures plainly teach that no flesh existed upon the earth before Adam, I have to agree with the idea that Scripture alone is Scripture. Even Harold B. Lee (while President of the church) made this point at a European general conference. But, certainly, these texts you have quoted present that the people currently holding these offices in the church are in full agreement with your sentiments. In support of your point I would add that it is plain nonsense to claim that a person can prove that something is such and such an age, when there is no way to prove the hypothesis upon which it is based. True science DEMANDS evidence. If I claim my dating method proves something is millions of years old there has to be a way to prove that it is such that is absolute (eg a time machine, footage from aliens, someone who was there at the time). As all these things are highly unlikely (particularly as the Scriptures plainly tell us there was no such time) we have to be realistic and accept what the Sciptures say, rather than, the so often disproved, "science" of man. this is silly. PMG references places that discuss ndbf, but not once do its own pages state such a doctrine. there is a difference. The above post does NOT claim that Preach My Gospel teaches no death before the fall directly from its own pages. But because Preach My Gospel (both explicitly and implicitly) sends its readers to sources that DO teach no death before the fall, that doctrine will be learned by those who follow the study outline.